The use of images in struggle. Online Course on Transforming Civil Conflicts, participants’ contributions on the use of images in struggle. Modus Operandi, in collaboration with The Network University, is running a new online course on Transforming Civil Conflicts. A group of twenty students from 12 different countries have come together in an online learning community to share their experience of working in conflict situations and learn about existing tools and concepts that better help us to analyse and act in order to transform the harmful aspects of conflict into constructive change processes. One of the topics the course addresses is the difference between conflict parties’ positions, interests and needs, drawing on John Burton’s human needs theory. As tensions rise, the degree of direct dialogue between conflict parties generally decreases. More and more, actors take clear positions and express themselves through the use of statements and symbols. Throughout the course participants have provided illustrations of images that conflict actors use and have analysed their message and the needs behind it. One participant, for example, commented on a picture of an drawing representing a character created by a Palestinian artist, Naji al Ali, who was forced into exile in 1948. He is commonly used as a symbol of the struggle as graffitti or on clothing; the needs which he represents are basic Human Rights and the Right to Return ». His name is Handalah and he represents a ten year old boy who was made to leave his country. He never ages until he can return home and he is always portrayed as barefoot to represent poverty and suffering and with his back to us because as a child he refuses dialogue. The participant explained that this position has become increasingly popular amongst the population in the West Bank and Gaza as a result of the apparent collapse in dialogue between the Israeli state and Palestinians. As an innocent child, perhaps he can be used a counter to other more violent or religious imagery. A comparison is interesting between above symbol and the one used in many different struggles (South Africa, Serbia, Occupy movement), that of the clenched fist. 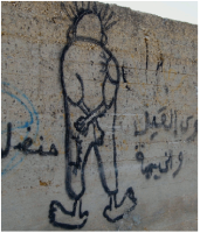 More violent imagery is also present in the Palestinian struggle, for example, a stencilled symbol of Al Aqsa Mosque in Jerusalem is often used as graffitti and there are usually guns in the picture. This presumably is a direct result of the Intifada (1 or 2) and relates to the fact that Al Aqsa is a worldwide symbol of sacred Islam: i.e. the enemy has not just taken our land but also insults our religion ». Art has the capacity to create another social reality, to give voice to the voiceless or to imagine a reality beyond conflict. Dreaming a new future is an effective weapon in struggle.